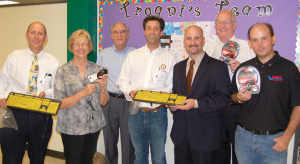 Clear Lake City Elementary Principal Jepsey Kimble, fifth from left, thanks Space Center Rotary members John Wren, Marilyn Musial, Jerrold DeWease, President Scott Rainey, Jerry Smith and Jeffrey Klima, from left, for the club’s gift to his students. Students at Clear Lake City Elementary have been enjoying their Dell computer tablets as a result of Clear Creek Independent School District’s 1:1 Initiative. And now, thanks to a generous donation from Space Center Rotary, the students’ virtual learning environment will be enhanced. To celebrate their 50th anniversary, Space Center Rotarians have committed to 50 acts of kindness for their community, and they chose Clear Lake City Elementary as the recipient of one of these acts. When Rotarians met with the school staff to discuss the best use for their $1,000 donation, the answer was clear. “I knew that when our fourth and fifth graders piloted the Latitudes [Dell computer tablets] last year, teachers found a need for external keyboards, mice and headphones to allow our students to use their tablets much more productively,” said Kari Euker, Clear Lake City Elementary counselor. That was all Space Center Rotary needed to hear. The club promptly purchased 40 sets of keyboards and mice and more than 200 headphones, enough for every fourth and fifth grader, and hand delivered the items to very excited students.